Backcountry trails, well-trimmed golf courses, utility lines free of obstructions and front yards free of stumps or fallen trees. We use a brand-new fleet of powerful, versatile, tree service vehicles to make tough jobs easy in summer or winter. 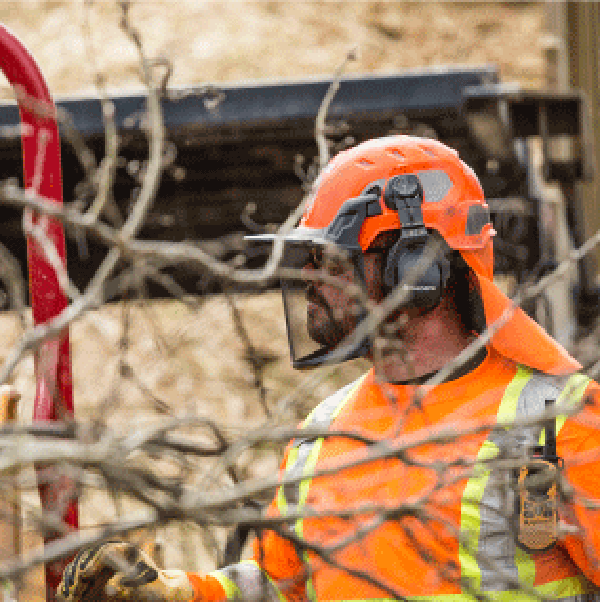 Whether we’re chewing through brush or carefully moving a single tree, we’ve got the tools to get it done. At the end of the day, our priority is for our clients to save time, save money, and avoid headaches- and to always leave the job site in spotless condition. 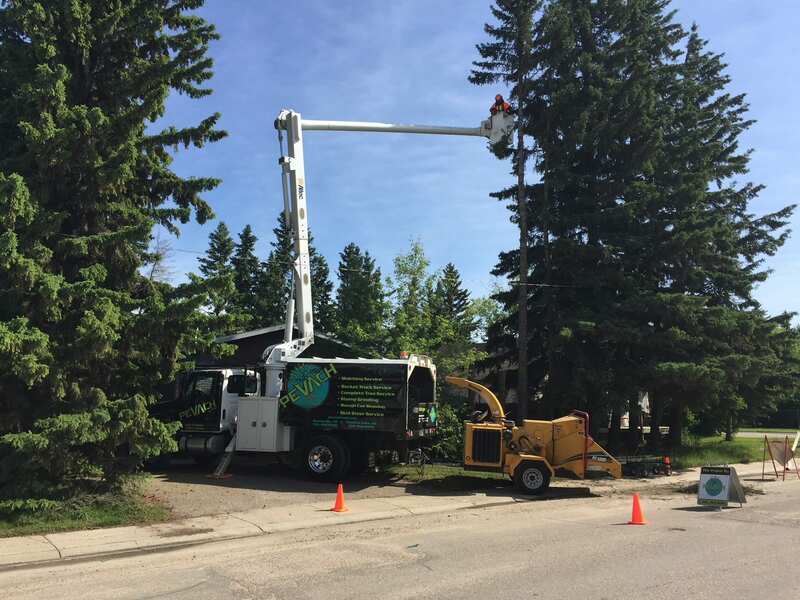 We're proud to offer tree services in northern Alberta, Saskatchewan and beyond! 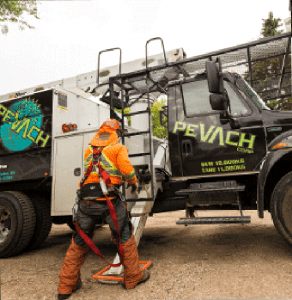 Proudly serving clients in Alberta & Saskatchewan, our cutting-edge fleet is perfectly suited for projects of any size, anywhere from front yards to backcountry and for clients from international companies to local governments. Learn more about us here. Our fleet of mulching equipment is a hot knife and the toughest vegetation management jobs are butter. 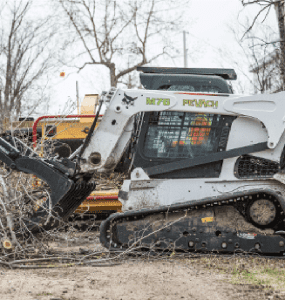 We can charge through brush, clear overgrown lots for construction, create fire breaks to protect forests and keep trails and utility lines free of obstructions—and we can do it fast. Clear an area for good, instead of the years it takes to slash and burn a patch of ground. 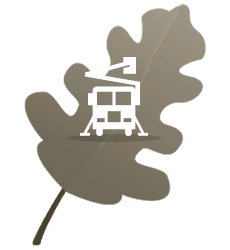 Our state-of-the-art bucket trucks lets us scale tall trees with the touch of a button and when we’re feeling a bit nostalgic we’ve got the right training and equipment to make like Tarzan and scale a tree. 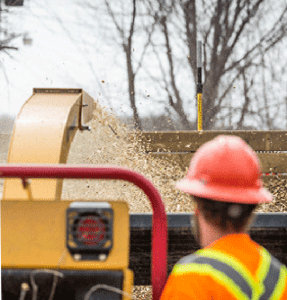 Plus, we’ll use everything we trim for mulch or wood-chips, so there won’t ever be any mess left at a job site. Sometimes trees and brush aren’t where you want them to be, whether they’re blocking a snowmobile trail or threatening to overtake your home. 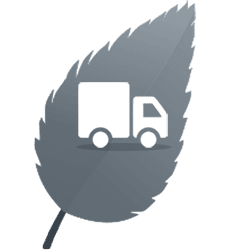 We can pick up and move small to medium trees and bushes and put them down in a new location, quickly and easily (along with squirrels) without damaging the tree or ground. This makes it easy to totally recreate your yard, tame your bush, or create new wooded areas. Clearing obstructions from utility lines and oil pipelines and keeping a municipal trail free of brush is easy with our fleet. 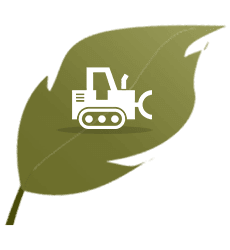 We aren’t limited to just doing rough-cut mowing or hydro Axing: our CMI machinery and rotary heads can cut through branches and saplings like they aren’t even there. 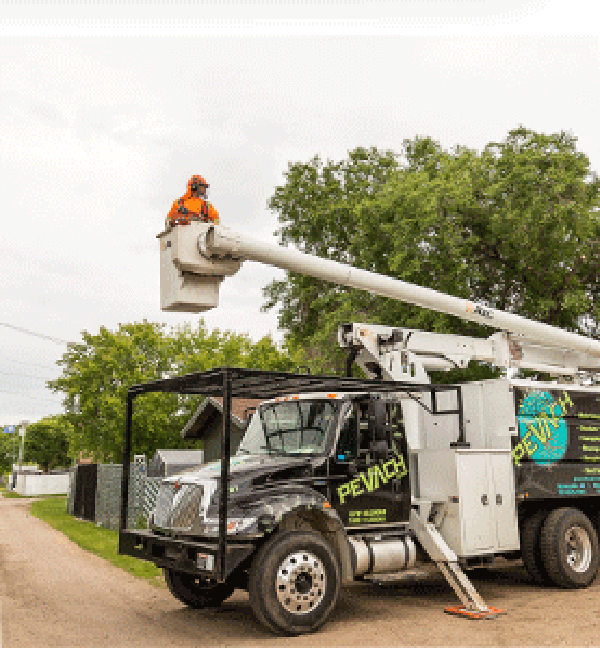 We use state-of-the-art bucket trucks and 100-300 horse mulchers to get almost any job done. Using the latest technology we can get jobs done fast in any season. 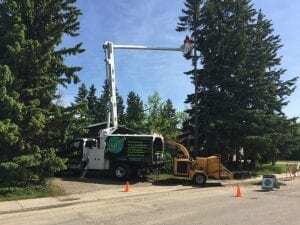 Everyone we employ is an experienced environmental services professional, and we now have a specialist Utility Tree Trimmer on staff. We aren’t just equipment operators, we’re people who think about what we do and come up with smart solutions. We’re focused on service first: turning up on time, giving accurate quotes, doing the job without mistakes and errors then leaving a work site in a better state than we found it. Fill in the form below and we'll get back to you within 24 hours during the work week — guaranteed. Spring is a busy time for us, but we know that’s when most people want work done so they can fully enjoy the summer. Enter your name, phone number and email address in the boxes below and inquire about booking ahead for your tree services job this spring. You’ll also have opted in to receive the occasional email from us if we have other offers or news.